We are women from around the world fighting to end captivity, the drive hunts and the cruelty to cetaceans globally Click here to see where an event is located near you and get involved. Isn't it time to be part of the solution? 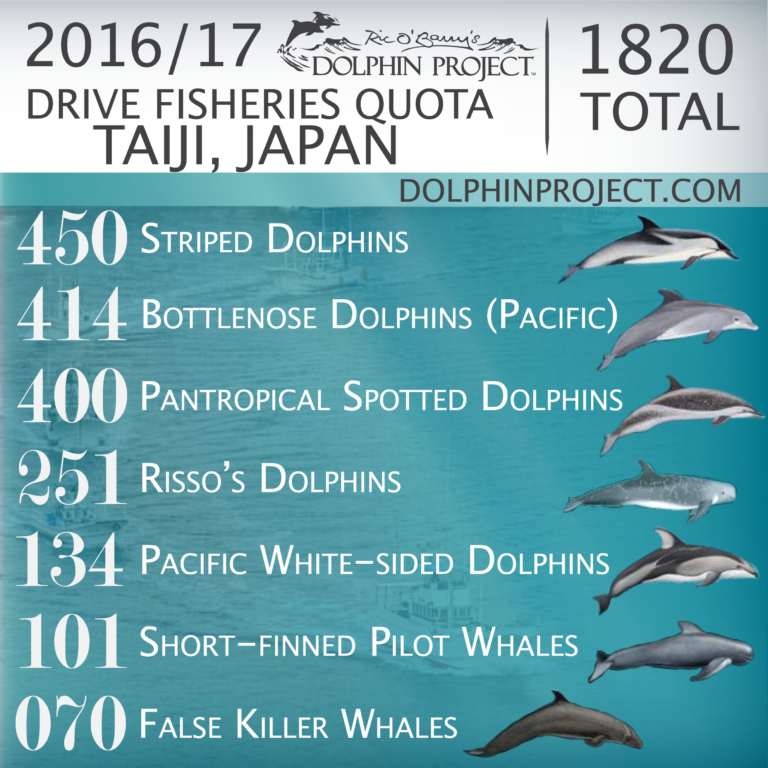 The drive season has started in Taiji and people at captive facilities are calculating their needs for the next drive season. Now is not the time to get complacent, now is the time to be as active as you can. Start a march, hand out pamphlets, educate friends, family and strangers. The world can not change unless they have all the necessary information to make better decisions. When you purchase a ticket to a captive facility such as SeaWorld you are keeping the drive hunts alive. You are contributing to an extremely abusive system that can only continue with the support of the consumer. While we try to evolve as a species, the human race will have to evolve their ways of life. If you support captivity you are directly supporting the selection & killing of hundreds of migrating dolphins every 6 months in Taiji, Japan. 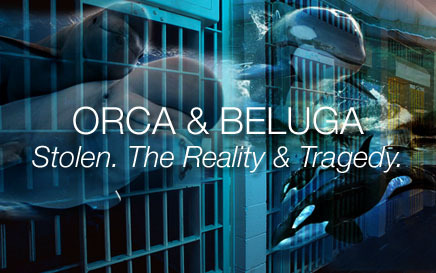 Orca & Beluga Whales being stolen from the seas! The slavery of cetaceans unveiled. Read & share. Please watch The Cove and Blackfish, so you can be fully educated about what captivity does to these sentient beings. Teach your children to respect the ocean and all its creatures. Click here for some fun ideas instead of the captive theme park. Once you know the truth silence is not an option. 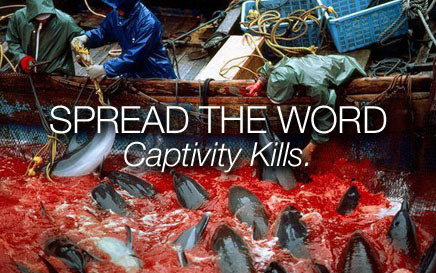 For every 1 taken into captivity 17 of their family members will be slaughtered. Cetacean releases that have actually happened! Also: Read about Sea Pens to retire captives! Click Here to Watch The Cove NOW. A Worldwide Movement to END Captivity and the Drive Hunts for the Captive Industry in Taiji, Japan. We're doing this through education. Join us! SIGN & SHARE our Urgent Petition for Orca & Belugas! Read in Your own Language Here! Want to learn more? 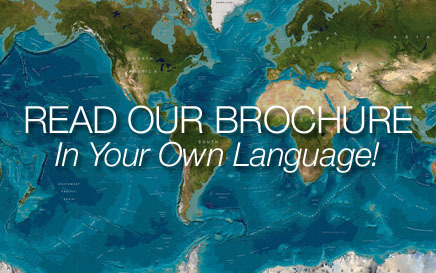 We offer visitors a chance to read our Brochure in their own Language on-line. More languages are always being added so check back often. Printable brochures are available on the side bar of most pages under "Print Items"! 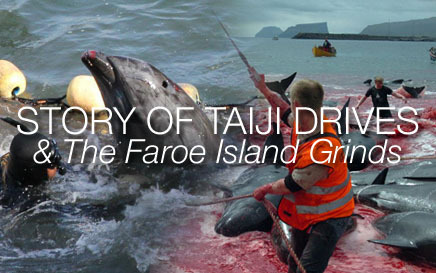 Stories of Taiji Drives & The Faroe Grind See and read the stories of both the Taiji Drive Hunts and The Faroe Island Grind. These pdf books make it easy to share. Our goal is to shine a bright light on these activities and to show the world that generations are being wiped out as we speak. Please help save them. Captive Facilities Fuel Slaughters The supply and demand is the number one cause of the capture of dolphins every year. 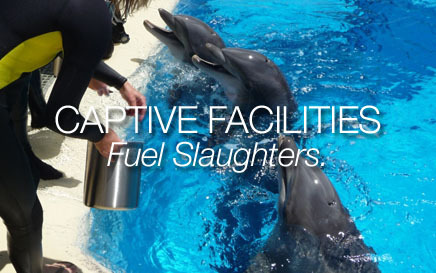 When you support captive facilities you are basically shaking hands with the killers. Every bottlenose dolphin sold to a captive park brings big money up to $155,000 US dollars. Spread the Word! Captivity Kills! Did you know they drive dolphin pods into the killing cove where they are slaughtered by sharp objects being driven into them to sever their spinal chords and blocking up their blow holes with corks so they drown in their own blood? It happens in Taiji every year. Help us educate the masses. Each time you, a loved one or friend buy a ticket, you support captivity in turn keeping the drive hunts alive. It is up to each one of us to do our part in putting an end to captivity worldwide. Even if it isn't happening in your state or country it doesn't mean we don't need your help! 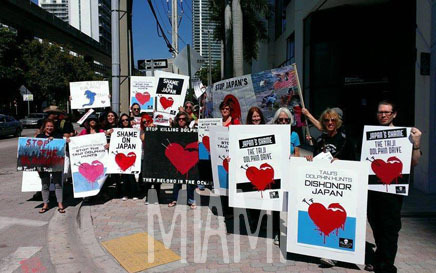 World Love for Dolphins Day This photo was taken in Miami where people gathered to express their love for our precious cetaceans and to protest captivity and the drive hunts. 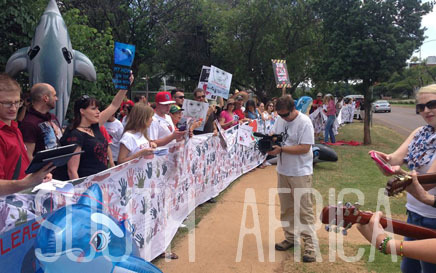 World Love of Dolphin Day This photo was taken in South Africa, where like minded individuals gathered to support Sea Shepherd for trying to protect the oceans and bring more awareness to the drive hunts they report on every year in the cove. World Love of Dolphin Day This photo was taken in London where supporters of ending the dolphin drives gathered to educate people about captivity and the deaths that happen around the globe entirely for money and greed. 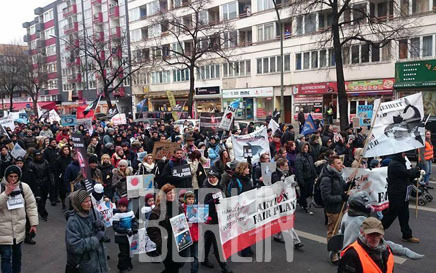 January 2015 A great turnout for the Berlin March in January 2015. As you can see the awareness is spreading. 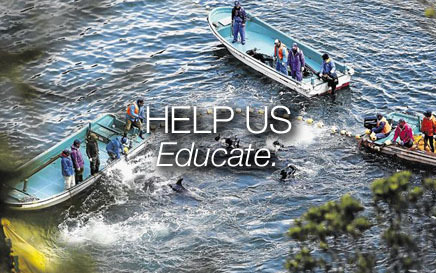 Do your part to help end captivity and the dolphin drive hunts. Ladies please join us when you're on Facebook by joining our group. Request by clicking here. Help us spread the word when you're on Twitter by joining our tweet storms, by clicking here. Thank you to everyone who has done something to fight for cetaceans in captivity everywhere. Contact us by clicking here. 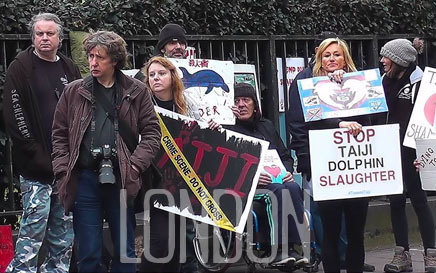 ©2014-2017 Women of the World United Against Taiji. All Rights Reserved.